Welcome to Serious Consulting’s elearning site. Our first course is now live. 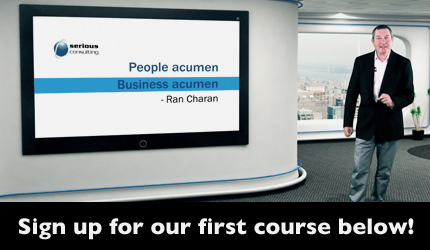 Over the coming months, we will release more courses, based on demand from our clients. To sign up for High Performance Leadership, enter your details in the registration box and we’ll give you access to the content immediately. In our first elearning course, in 5 modules lasting 40 minutes, one of Serious Consultings, co-founders, Jonathan O’Donnell-Young gives his insight and plenty of practical information on how to practice becoming a great leader. In his own, passionate style, he helps you to learn from his own mistakes as he focuses on two key skills – Management By Walking Around and Reinforcement. Serious Consulting helps all people at all levels in an organization understand the link between their behaviour and the achievement of the desired results. We give people the skills and confidence to successfully change their behaviour, where necessary, in order to achieve the desired outcomes. Serious consulting also helps companies establish and maintain systems and processes that effectively and meaningfully manage and reinforce the highest levels of performance. Serious Consulting’s mission is to help you inspire, support and deliver world-class performance in your company. We do this by helping you connect your strategic objectives with actual business outcomes. We have recently invested in articulating our “values”. This proved to be time very well spent as we were reminded why we do what we do. Enter your details to get free access to our 6 module course below. "One minute spent waiting is time lost, time you will never get back. If you want change, change that's sustainable, we make it happen - fast." © Serious Consulting Pty Ltd Training video production by The 8.45 Club.